When I moved to Japan, I brought along my sisters old laptop. For those reading this in 2014, you probably think of a laptop as a wafer thin, feather light device that easily pops into a bag and travels everywhere. This may be true now, but it was not true at all about a laptop from 1999. My sister’s laptop was an IBM Thinkpad that featured a Pentium processor running about 133mhz. It weighed just over 3kg (6.6lbs) and would no longer run on battery power for more than 30 seconds. The hard drive was somewhere in the neighbourhood of 1-2GB. It had a CD drive built in (not a DVD drive), and an external floppy drive. There were no USB ports. The advantage of bringing along this dinosaur of computing was that it easily fit into carry-on luggage, as opposed to my more powerful desktop tower that stayed in Canada. Also, the power connector worked on a range of voltages, presenting no problem plugging in to Japanese outlets. The disadvantages are fairly obvious from the description above. Since I didn’t have any internet connection, I needed to go to the internet cafe to update my blog. I could, however, prepare the pictures and text entries for upload at home, then copy them onto 3.5″ floppy disks to take to the internet cafe. Since each disk could only hold 1.44mb of data, I would always need to resize my pictures for transport. This was a complete rewrite from the original post, because I am sure that many people don’t remember how horrible laptops were in the early 2000s. I FINALLY got to see Lord of the Rings: The Return of the King! Movies are usually released in Japan about 1-2 months after the North American release. It was a great movie, but I still like Fellowship of the Ring the best. For reasons unknown I only had to pay 1200 yen instead of the usual 1800 yen admission fee. However, you won’t hear me complaining. Once again I love the fact that the major movie theater chains have reserved seating. This is something that theatres back home should copy. You can buy your ticket and not have to wait in line to rush into the theatre and get a good seat. Due to being incredibly lazy, I ate Wendy’s twice today. Being homesick = more burgers than usual. Thanks to a shift swap, I spent the day hanging out with The Penpal in the Noborito area instead of working. We spent some time at Hello House, and then walked to Ikuta Park, which is located near Mukogaoka-yuen station. 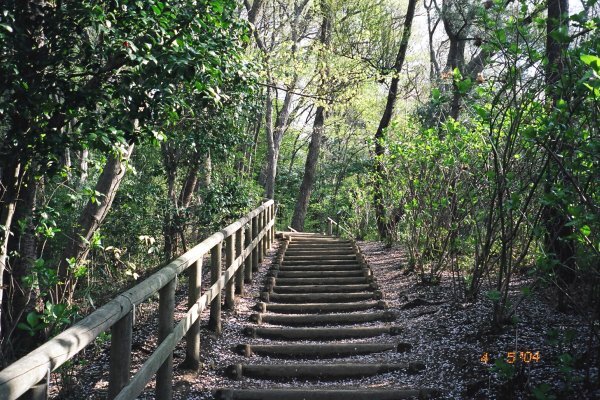 Unlike many “parks” in the greater Tokyo area which consist of a tree and a bench, Ikuta park is actually a real park. The scenery is a start contrast to the surrounding area. When you enter, the city simply stops and you are surrounded by nature. I will have to come back in the spring! (2014 update) As you can see from the date stamp on the picture, I did go back in the spring. Today in my 5 lessons at work I had 3 good lessons, one lesson where I totally forgot what I was doing half way through, and one lesson where a student hit her head on the table when helping me pick up some flashcards that I dropped on the floor. Learning English really does hurt your head. What a productive day! I slept late, picked up my dry cleaning, got pictures developed, got my hair cut, watched an hour of Simpsons, cleaned my room and washed my dishes immediately after using them (for a change). Upon preparing this entry for publishing 10 years later, I notice that I have not yet explained the terrifying experience of getting your hair cut in a foreign language. It is something definitely worth more than the few words that I used in my original post. My hair is very annoying. It doesn’t grow long like most people, it just gets thick and poofy. While growing up I have had several people suggest that I grow and epic white guy fro, but that’s not going to happen. In order to prevent the fro, I usually need to get my hair cut every 4-6 weeks, with 8 weeks being the absolute maximum. I got my hair cut ridiculously short before leaving Canada, but a few months after arriving I was badly in need of a haircut. I asked some of the guys in Hello House if they had any recommendations for a good place to get a haircut. Most people suggested a barber shop near Mukogaoka-yuen station, and I also got a few suggestions to buy my own clippers and just cut my own hair. Since I didn’t trust my ability to cut my own hair without turning my tatami mat into a hair carpet, I decided to test my Japanese skills at the barber shop. At the barber shop there was exactly one person who spoke English – me. I got into the chair and was asked a question which I assume was “what kind of haircut would you like”. I had some instructions prepared, but forgot them all in the moment and managed to say “zenbu mijikai” (everything short) while making a confusing gesture around my head. The barber responded in Japanese by confirming that I wanted a really short haircut (probably). I agreed and proceeded to get a military quality buzz cut. Having someone cut your hair when you can’t fully communicate is a scary experience. Having someone cut your hair when they have never before worked with hair the same colour or texture as yours is even scarier. As scary as this was for me, it was worse for women who can’t speak Japanese. Many of my female coworkers would go very long times between haircuts, and then would only get their hair done in a very expensive salon where someone could speak English. I did get better at communicating with barbers over my time in Japan, but always got really short haircuts because it was the easiest thing to do. If you are planning on spending an extended time in Japan, plan ahead for your hair cutting needs. Wow was I tired today. I slept through several alarms, and managed to wake up around 2:00pm. On the train to get to the internet cafe, a random Japanese man started talking to me in Japanese. I managed to hold up my part of the conversation reasonably well. He was also talking to himself quite a bit, and started singing a song about NOVA. You really do get to meet some interesting people on the train!